This post is part of our year-long series about North Carolina's weather extremes. Winter weather in North Carolina can be a fickle thing. When cold air and moisture come together at the right time, the outcome can be an impressive snowstorm. However, even small temperature differences throughout the atmosphere can turn a potentially scenic, snowy landscape into an icy one. 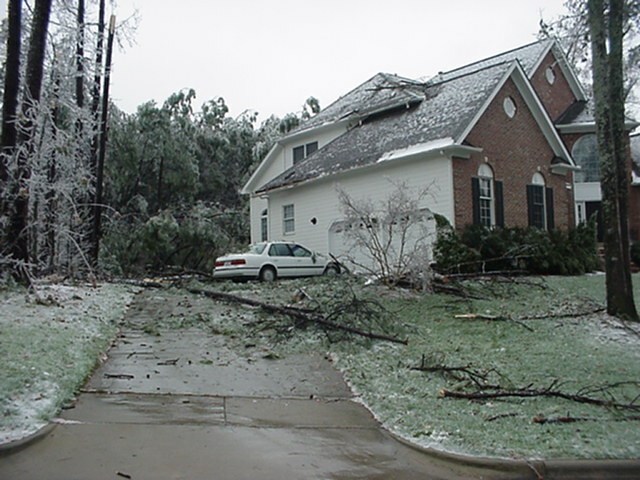 In early December 2002, these conditions created a historic ice storm for the Piedmont. The first ingredient for the 2002 ice storm was a high pressure system over the Northeast US. The winds around the high provided a northerly feed of low-level cold air, which was held in place by the Mountains in a cold air damming or "Appalachian wedge" setup. 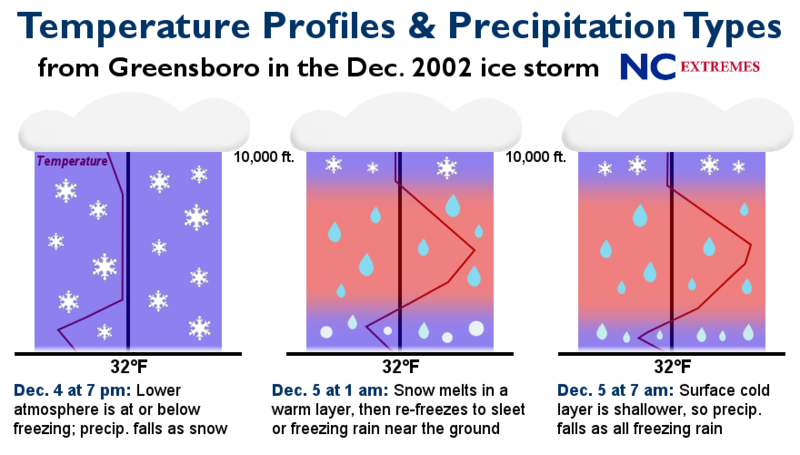 The evolution of low-level temperatures and precipitation types in Greensboro during the December 2002 ice storm. This pattern is common for many of our wintry events since it ensures that surface temperatures are cool enough for frozen precipitation. All day on December 4, statewide temperatures stayed in the 20s and 30s. However, cold air near the ground doesn't always mean it's cold farther up in the atmosphere. Air above the mountaintops is free to move elsewhere, so unless there is a feed of cold air aloft, the surface cold layer can be quite shallow. This was the case in the 2002 event, as warmer air fed in from the west less than a mile above the ground. That created an atmospheric temperature profile with cold air aloft and near the ground separated by a thin above-freezing layer that would melt any precipitation falling through it. While the feed of Arctic air from the north meant cold air near the ground, that air was also quite dry, with surface dew points in the single digits. The moisture needed for precipitation came from a pair of low pressure systems -- one to our east and one to the west. The coastal low began taking shape along the Gulf coast early on December 4. That afternoon, the inland low developed on the western edge of a frontal boundary. This setup with two lows separated by the cold wedge is sometimes called a complex or Miller type B storm. As both lows moved northeastward, precipitation began across the state and dew points quickly rose into the upper 20s, approaching the air temperatures and saturating the air near the ground. Light snow began in the western counties by 10 am, while the coast received rain and freezing rain beginning around 5 pm. In the western Piedmont, evaporation throughout the lower atmosphere initially helped cool the air, so snow fell for up to 8 hours in Greensboro with accumulations of 2 to 3 inches. However, the warm, westerly flow above the cold dome caused a nose of above-freezing temperatures to emerge. Precipitation falling through that warm layer melted into droplets, then either re-froze into sleet pellets or became super-cooled liquid droplets that froze on contact with the surface, giving dreaded ice accumulations. In central and southern North Carolina, where the cold dome was shallower to begin with, the changeover to freezing rain happened several hours sooner. The Charlotte and Raleigh-Durham airports each reported just two hours of light snow before transitioning to sleet and freezing rain. Once the freezing rain began, it lasted for more than 12 hours with up to an inch of ice accumulation in parts of the Piedmont. The weight of that ice toppled branches, trees, and power lines, resulting in widespread outages. Duke Energy reported more than 1 million customers were without power in North Carolina, and 57% of customers in North and South Carolina lost electricity. That broke a record from 1989 when Hurricane Hugo tore through both states, and nearly doubled the number of outages from the February 1996 ice storm. Carolina Power and Light reported almost half a million more customers lost power in the Triangle. A spokesman for the company called the event "Fran with ice", referring to the 1996 hurricane that caused widespread damage across the region. It took nearly 10 days -- until December 14 -- before electrical services were completely restored. In the meantime, some people used kerosene- or gas-powered space heaters and even charcoal grills to heat their homes, which presented additional hazards. A nine-year-old boy was killed in a fire started by one of these heaters, and more than 200 people were hospitalized at the Duke University Medical Center for carbon monoxide poisoning resulting from poor ventilation. The N.C. Insurance News Service estimated insured property damages at $113 million, and FEMA provided nearly $11 million in assistance, primarily for debris removal and utility restoration. That was a hefty price tag for -- by most accounts -- North Carolina's worst ice storm on record.